While writing a presentation with beamer it may be convenient to have some backup/appendix slides ready as a support for answers to potential questions. By default, beamer will count the total number of slides, including the backup slides at the end of the presentation, leading to a wrong number of total slides intended for presentation. The package appendixnumberbeamer solves the problem through the \appendix command which marks the end of the presentation and resets the page number counter. 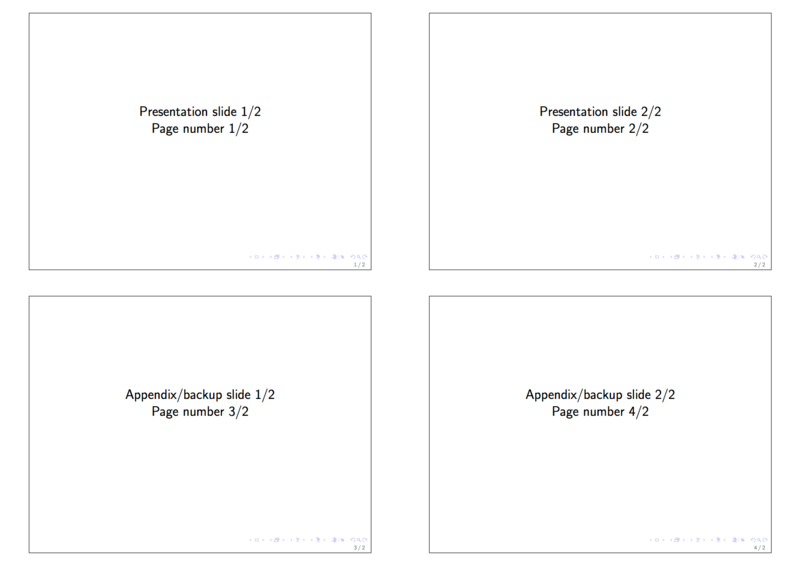 The total number of slides will be the page number of the last slide before \appendix. Here is a minimal example to illustrate the result. The documentation for the package is sparse, but there is not that much to be said. For those interested, the package description can be found in the header of the package (style file) itself. In case your distribution does not include the package, download the style file and place it into your project directory. Would you mind sharing your code? I’d be interested to see how you did it. Thanks, Tom. Thanks for sharing this. Pretty cool and potentially useful for other problems where no package is available!